Even with the best desktop in the world, a crumby monitor can easily ruin the experience. However, compared to even just a few short years ago, budget monitors have become much better to help you build your own budget-friendly PC without compromise on the price. So we set out to find the absolute best budget monitors that you can get in 2019. 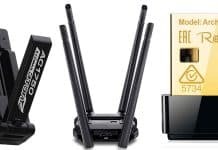 We looked at tons of different models and chose the four that appear on this list as the best of the best. 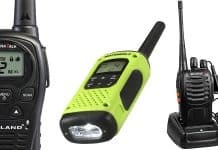 Each one specializes in a different area, so one of these monitors will undoubtedly suit your needs no matter what you’re looking for. Coming in at the very top of our list is the AOC G2460PF. 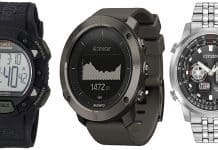 It boasts incredible performance for its price and sits right at the top of our 200$ price limit. The screen measures 24 inches diagonally and has a cool brushed aluminum finish around the entire bezel with some red trim on the bottom as well as on the stand. This gives it a very gamer oriented look and would go well visually with any gaming setup. The stand is the best on our list, with a built-in cable management clip on the back and the ability to rotate in practically every direction. AOC can be turned 90 degrees to be used in a vertical orientation, moved up or down vertically to adjust itself to the best height or be tilted up or down to ensure the best viewing angle. The 1080p resolution monitor runs at an incredible 144Hz refresh rate, which makes gaming super smooth. The G2460PF also has a rock bottom 1ms response time, which ensures that your control inputs feel responsive and immediate, and even giving you a slight edge over your competition. It features 350 nit brightness and an astounding 80 MILLION to one contrast ratio. This ensures that your games or work are always clear, even in bright rooms. While it is the most expensive model on our list, the G2460PG from AOC is a great choice for gamers looking for an exceptional, but still, affordable to help them get the best gaming experience and crush their competition. Especially if you have an AMD graphics card, as this support FreeSync. 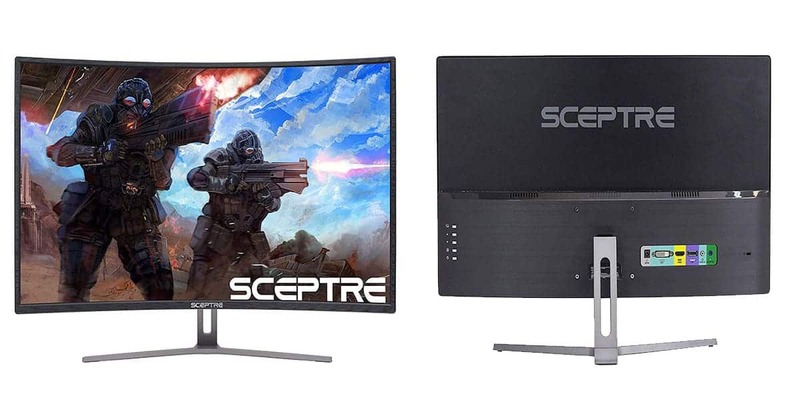 For those who want to maximize their immersion in games and movies while using their new monitor, the Sceptre a248B-144R is a great budget option. This 24-inch screen features an 1800R curvature that makes it great for use as a desktop display. This curvature rating means that it has an aggressive curvature to it, much more than would be expected from something like a curved TV. The advantage to this is that it wraps around you more, which is great for a computer screen where you’ll be sitting very close to it. Not only does this monitor feature and aggressive curvature, but it can drive its 1080p resolution at 144Hz refresh rate. As mentioned on the last we looked at, this is great for gamers looking for buttery smooth motion in their games. It also has a cornucopia of features that really help late night gamers, especially those who are using an AMD GPU. 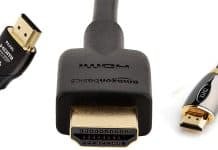 For one thing, this is compatible with AMD FreeSync, which matches your monitor’s refresh rate to your graphics card’s rendering speed to prevent screen tearing. This happens when your display is already rendering a new frame but your GPU is still finishing the previous one. This results in two images being displayed on screen at once with a line through the two, making it look like the image has been torn in two. Some of the other great features of Sceptre C248B-144R are an anti-flicker backlight and a blue light shift mode. These help prevent eye strain and allow you to game for longer times in low light without hurting yourself, something we should really not be encouraging, but let’s be honest you’re going to do it either way. Next on our list is a great budget monitor for productivity-minded users. This 25-inch widescreen from LG measures 15 inches in width, making it the largest, and by far the widest in our roundup. The screen runs at a 21:9 aspect ratio with a resolution of 2560×1080. The IPS display has excellent viewing angles, which is important with such a wide monitor as you could be looking at much of it at an angle depending on how close you sit to it. While the widescreen layout does offer a very immersive experience in games, where this monitor really shines is when it comes to productivity. If you need to work on a project or paper, this is wide enough to allow you to open multiple documents at once so you can constantly have your reference material in view while writing. It also boasts LG’s dual controller and screen split features. These allow you to essentially virtualize the monitor into four different ones, showing various documents, windows, and programs on each part of it. The dual controller feature allows you to connect two computers to the monitor, and manage both with a single keyboard and mouse. On top of all this, it has 99% coverage of the sRGB color space, making it great for photo editing work. While this display’s 60Hz refresh rate makes it less than ideal for gaming, it is a beast in the realm of productivity. The dual controller, widescreen space, and screen split features allow you to reach new levels of efficiency while working, and it’s even suitable for work where color accuracy is very important. 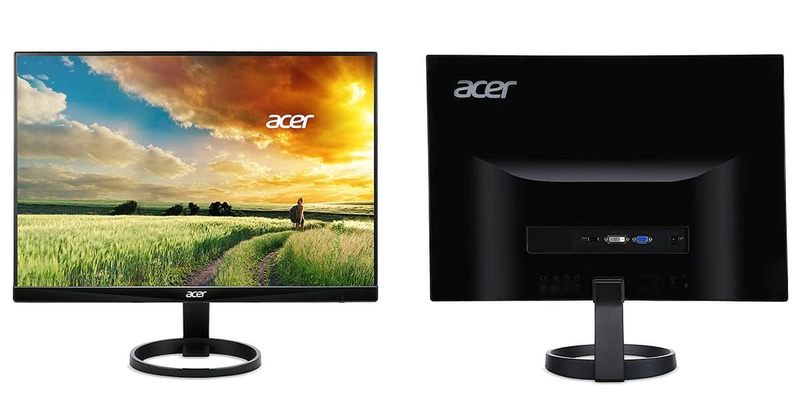 The last monitor we’re looking at is the ACER R240HY, which is the most affordable one on our list. If price is your bottom line, and all the extra bells and whistles don’t appeal to you, then this is the monitor for you. Despite its price, ACER R240HY still brandishes some good features. It runs at a standard HD resolution of 1080p and has a 60Hz refresh rate. The included stand is actually pretty nice, with the ability to tilt up to 15 degrees for easy viewing. The IPS panel inside it has 178 degrees of viewing angles, which is nice when trying to move around or show someone something on your screen. It also features a flicker-less backlight to help with eye health in the long run. This is also eco-friendly, with an energy star rating for efficiency, and a mercury-free design. It has pretty good input options, including HDMI, DVI, and VGA, which is more than the LG monitor we looked at can claim. This also looks surprisingly nice for the price, with the thinnest bezel of any of the monitors we looked at. 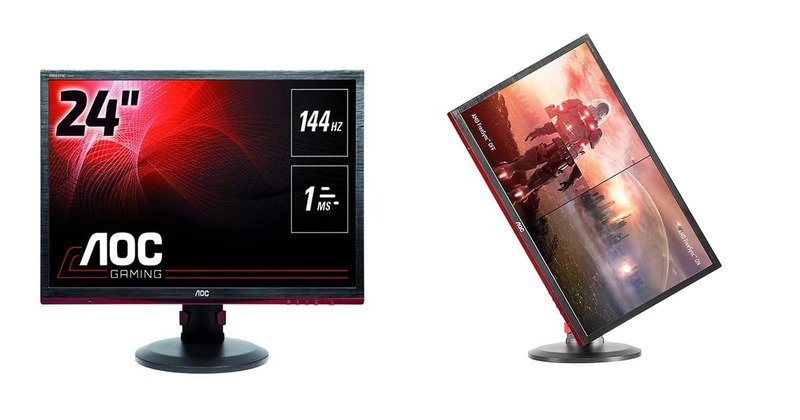 With Acer’s zero frame design is great if you plan to be using multiple monitors, as it gives them an almost seamless look when placed side by side. While it doesn’t have a high refresh rate, free sync, or really any exceptional features, it works well and is the most affordable monitor on our list. It’ll do its job well for either work or gaming, and won’t hurt your wallet as badly as a more premium option. If your budget is truly what matters, this one is a great choice. Each of these on our list was chosen for a very specific reason. Each one specializes in something different, and we feel that no matter what your needs are, there is an affordable one our list that is right for you. If you’re looking for a great gaming monitor, then the first option on our list from AOC is a great choice. This monitor has a high refresh rate and excellent response time, making it ideal for gaming. The curved Sceptre C248B-144R is also great for gaming as it also boasts a 144Hz refresh rate, and the curves makes gaming and movies more immersive as the image wraps around you and makes you feel like you’re really there. The LG 25UM57 is a great choice for people looking for a screen to maximize their productivity. Its widescreen layout allows you to easily look at multiple documents or windows at the same time. Along with LG’s dual controller and screen split technology, it will drive your productivity through the roof. Finally, the Acer R240HY is an all-around decent one for a great price. If you’re truly just looking for an inexpensive one then this is it. 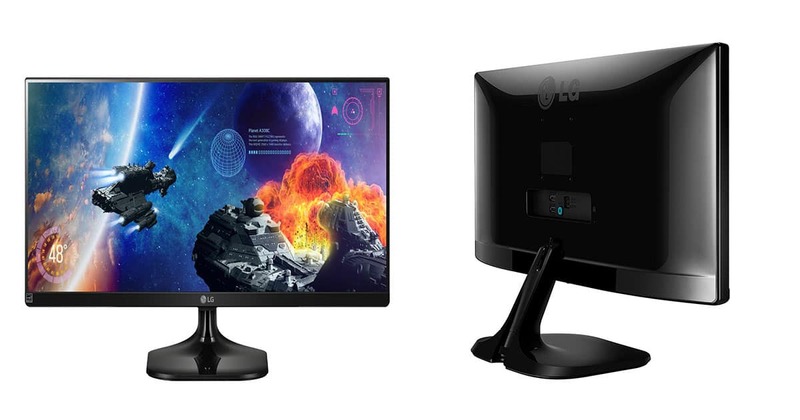 Aside from the curved screen and widescreen options, the main things to look at to differentiate between these monitors is the refresh rate and the color space. The refresh rate is measured in Hz and is how many times the screen will show a new frame each second. Almost all movies and shows are in 30fps, while some venture into 60fps territory. Since no movies or shows go above 60 frames per second, this is adequate for Netflix viewing and working. Games, on the other hand, can have frame rates well over 100 depending on the specs of your PC. For this reason, higher refresh rates are desirable for gamers. The higher your refresh rate the smoother fast movement will appear, which makes it easier to spot enemies in games, and can even give you more time to react. The AOC G2460PF, as well as the Sceptre C248B-144R both, have a 144Hz refresh rate, making them great for those planning to play games on their monitor. Color space is a term used to describe the range of colors a monitor can produce. A monitor with a poor color space will not be able to produce as many colors, or produce them as accurately, as a superior one. This can be surprisingly important when handling tasks such as photo editing, where color accuracy is obviously very important. If you plan to use your screen for something like graphic design or photoshop work, then we recommend the LG 25UM57, which has a 99% coverage of the sRGB color space. What is the difference between an IPS and a TN display? IPS and TN are two different types of LCD or liquid crystal displays. The technical differences between them are far outside the scope of this article, but in short, has to do with the way the crystals inside the monitor are aligned relative to the polarizing filters and each other when working. The difference in the viewing experience is that generally, TN displays will start to change color when you look at them from an angle, while IPS displays will retain their accurate color. TN displays, on the other hand, are generally more responsive. TN displays are also generally cheaper to manufacture as the technology has been around for a longer time. FreeSync is a technology developed by AMD that synchronizes the refresh rate of your monitor with that of your graphics card. This prevents what is called screen tearing, which is when the GPU is sending information to the monitor about a frame that it is no longer rendering. This looks like a horizontal line across your screen where one frame is ahead of the other. 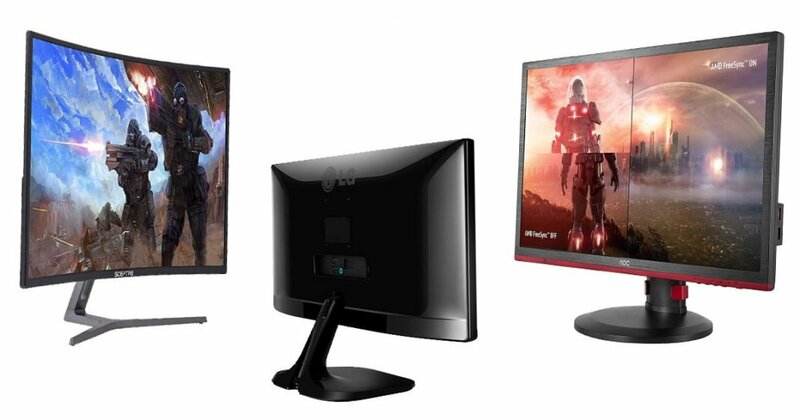 Whether you’re looking for a monitor geared towards gaming or one that will make you more productive while working, there is guaranteed to be a monitor on this list for you. We hope that our reviews and included guide have armed you with the knowledge to make an informed decision, but if you still feel unsure in any way, let us know by leaving a comment down below. We love hearing from you guys and would be more than happy to use our expertise to help you out. If you like our article then, you might also fancy Best budget PC Cases.